Humans are content to remain in the comfort of the familiar. They dislike change. They dislike the unknown. They fear letting go of what they know. They fear letting go of what they are used to. Where they live their lives. If you let go of the things that have taken up residence in your minds, in your hearts, in your emotions, what then takes the place of that? If you let go of negative things that you have built your life around, what comes next? Something worse or something better? The truth is, until you let go of the things you are familiar with, you will never know what waits for you. You will make assumptions about what it is, and they will take the form you choose, negative or positive, but the truth is not discovered until you let go of what has become comfortable. What is familiar. What you have decided to live with, blame yourself for, hurt over, be sad over, be stuck in. 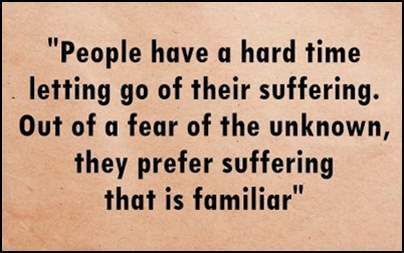 How do we gain the strength to venture into the discomfort of the unfamiliar? By peeling off the layers of the familiar in which we live. Years spent in adding more and more to what we are comfortable with, what we allow ourselves to wallow in, what we choose to feel every day, what we never stop thinking about. How do we undo this damage? One layer at a time. In my practice, I always have a worst first approach. If you cannot work through the worst thing first, you cannot get beyond anything that comes after. Everything else is informed by what happened first – what affects you most – what worst is for you. Everything else follows along after that, is added to that, is layered on to that. It is the hardest place to start and it is the most important for letting go, for learning lessons, and for moving on. The comfort of the familiar is very difficult to change because it is frightening. The layers we have added provide a way to not look at the things that started us on the path we walk over and over day after day going nowhere. If we remove the layers, then we have to look at the truth and the truth is scary, difficult, uncomfortable, and unfamiliar. Freedom is the only condition for happiness – letting go gives us happiness. If we truly desire to be free of events, thoughts, emotions that keep us stuck – we must let go – to move towards happiness. If you feel stuck in the comfort of the familiar of your past, perhaps counseling can help you find freedom. Call 406-413-9904 or email mindfulmontanawellness@gmail.com or click the BOOK button on Facebook to schedule a FREE initial counseling consultation. 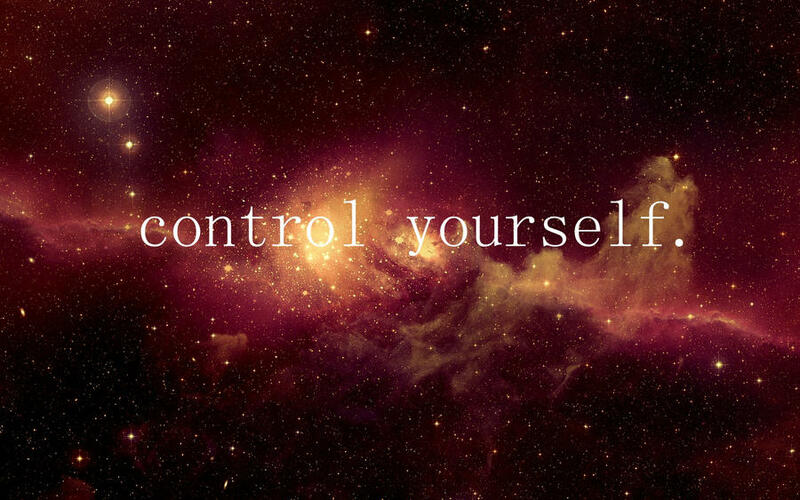 In all of the universe there is only one thing any of us can control – ourselves. Our circle of control resides inside our skin bag and there alone. Any other belief that we can control anything else is a lie we tell ourselves to attempt to either make things easier or justify our actions. Most of our lives are spent in the false belief that we can control other people, events, or emotions. We spend so much of our time and energy focused on how we can alter how other people behave or feel, change things that have happened or alter things that will happen. We rarely take the time to realize that our circle of control is again only that which is within ourselves. The belief that we can shape other people into what we want them to be is one of the main causes of our internal struggle that leads to anger, depression, anxiety, and frustration. When the urge to control things outside of ourselves takes over, we must confront it with the acceptance that we cannot control anything but ourselves and our own reactions. We cannot change anyone else. We cannot change how they feel or how they behave. We can only control our reactions to what they do. Also remembering that nothing anyone does or says is about us – not taking anything personally. It can be very difficult to master this letting go of control. Humans as a species are genetically wired to take control of any environment, dominate it, shape it to their needs, however we cannot control as much as we would like to believe. It can be very hard to let go of this idea of control and focus on only what we can do. We let our emotions drive us. We love someone, even when it is not good for us at times, and we want to change them so we can keep loving them, but they won’t change. We end up in a constant battle of knowing we cannot succeed and banging our head on the wall continually trying to make it into what we want. This only causes us more suffering, more frustration. Control yourself. Two words. It sounds easy enough but it is in fact one of the hardest things to do. It takes work, it takes sacrifice, it takes practice to let go of the belief that we can control everything and everyone around us. If we can, we can minimize or even eliminate much of the pain and suffering we cause ourselves. Control yourself – your emotions, your reactions. Never take anything personally – nothing other people do or say is about you. Let go of control – everything and everyone else outside of yourself. In Michael Ruiz book The Four Agreements, the third agreement is Don’t Make Assumptions. Making assumptions complicates so much of our lives and relationships to the point of ruining them in some cases. When we are very young, we continuously ask the question why. We are always seeking answers and explanations. It is only as we grow older that we stop doing that and start assuming the answers instead of asking the question. Instead of why, we assume it is because someone doesn’t like us or that the answer will always be no. Instead of talking to people to see what it is they really think and feel, we assume they don’t love us, we assume they don’t want to be our friend, we assume they think we are fat, dumb, ugly, lazy, weird, or any other number of adjectives. These assumptions make our lives and relationships chaos and cause us to believe all the stories we are telling ourselves instead of finding out the truth. We also make assumptions about ourselves and those agreements prevent us from living our best lives. We assume that were are not smart enough to make our dreams a reality, that we are not pretty enough or lovable enough to have a meaningful relationship with someone, that we are not cool enough for our peers to want to hang out with us, that we are not strong enough to be more than what our past experiences have taught us. We spend our every thought on assumptions about ourselves or about others and hardly a single moment on the truth or finding out what the truth actually is. Instead of letting the assumption become our reality, we need to stop the assumption as soon as it comes into our mind. To do this, we have to ask that thought if it is true, what is the proof that it is true and this has to be something that is real not just something we think. If this assumption is what we think someone else thinks we have to ask have we actually talked to them about this honestly. Every assumption needs to be confronted with the question, what is the proof that this is the absolute truth. Almost always, the answer will be that it is not or that we have no idea whether it is or not because we have not talked honestly with the person we are making the assumptions about. Find the strength to ask the questions of yourself and others. Practice asking honestly for the things you want. People cannot read your mind. Communicate openly and clearly with yourself and others to avoid the chaos of assumptions and the sadness and drama that it causes to your life. Practicing undoing this one agreement can completely transform your life one assumption at a time. Now accepting new clients, specializing in adolescent girls and adult females, in person and online counseling available in Montana. Call 406-413-9904 to set up your FREE Initial Consultation.